Whether systematically dispatching your foes with an array of equipment and powers or flitting undetected through the streets of a mythologised Japan, in Aragami: Shadow Edition, darkness is your greatest ally. Attempting its own spin on the familiar ninja stealth fantasy, Spanish indie studio Lince Works presents a streamlined, innovative experience with clear inspiration from all the right places. As an “Aragami”, a vengeful spirit summoned to seek justice for those in need, you’ll set out to rescue Yamiko, a mysterious young girl held prisoner, over the course of a single night. It’s standard “save the princess” fare as she guides you through each semi-linear level, eliminating or avoiding soldiers of the equally mysterious army of light, the “Kaiho”. Coupled with an amnesia plot line, as you strive to remember the origins of your creation, the story is unremarkable if just enough to keep you invested in the narrative framework of pushing forward. “What does this all mean?” supposes the Aragami, at the conclusion of the second of a surprisingly extensive thirteen mission campaign. By then I’d worked out exactly what it all meant… and I was correct. Whilst the writing on offer lacks nuance, it’s a different story entirely in regards to gameplay. 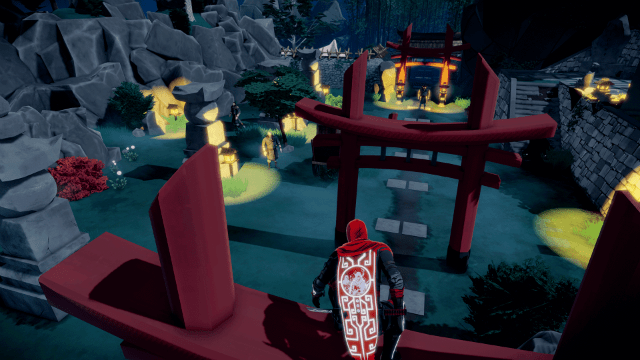 Aragami are beings of magic, and a short tutorial guides you through the basics of your expandable arsenal of powers. You’ll start with a simple teleport, the means to travel some distance from shadow to shadow, through gates and atop buildings for strategic advantage. Each area is a self-contained puzzle as you search for the next patch of darkness to see you through the level, and there’s no ultimately correct path for achieving your goals. Beyond an entry and exit point, traversal is left at the behest of your own creativity as you observe enemy patrol patterns, wait for an opportunity to strike, and vanish back into the nether. It’s enjoyable to revisit prior levels, trying something different with a fresh set of skills; the game changing ability to instantly dispose of corpses or the devastating “shadow kill”. There’s no passive progression system in Aragami and you won’t unlock abilities from simply playing the game. Instead, you’ll seek out collectible scrolls hidden within each level. Each power comes with an assigned cost of between 1-5 scrolls and, whilst it’s possible to attain every ability in the game, the scrolls aren’t always obvious in their placement. It’s a risky move from the developer, not so much encouraging exploration as forcing it. I enjoyed the challenge of deciding how best to initially build out my character with a limited number of scrolls, but some may not appreciate the required backtracking, as they painstakingly scour past levels. The stealth-focused combat system will feel familiar to fans of Tenchu and even the Metal Gear Solid series. Enemies investigate suspicious noises or movement, killing you immediately should you fail to teleport away in the split-second proceeding discovery. It’s a tense cat and mouse scenario as you weigh up the advantages of removing enemies outright, versus the risk of being seen. Manage to escape a pursuing guard and surrounding enemies will hunt you with increased fervor and aggression, weapons drawn. Unfortunately, the sluggish movement speed makes evasion a little more difficult. 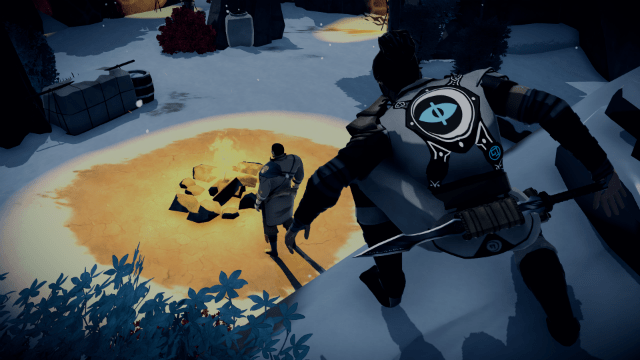 This isn’t fast paced hack and slash territory and you’re actively encouraged to sneak, but for someone supposedly adept in the ways of the ninja, even a mild jog feels like wading through treacle. In “Nightfall”, Aragami’s story expansion, character movement feels noticeably faster and cleaner. It’s a shame they didn’t go back to alter the main hero in the process. There’s a nicely balanced difficulty curve as you progress farther into the campaign. Levels are bigger, guards increase in number, travelling in groups and archers make their first appearance. Prowling atop lookout towers, they’ll limit your options to manoeuvre, requiring a constant change of tact. Enemies seek to exploit the Aragami aversion to light, deploying floating torches at choke points to sap your energy or obliterate you with proximity explosions. The occasional platforming section and some pleasantly creative boss encounters round out the experience, ensuring a fresh challenge with each new area. 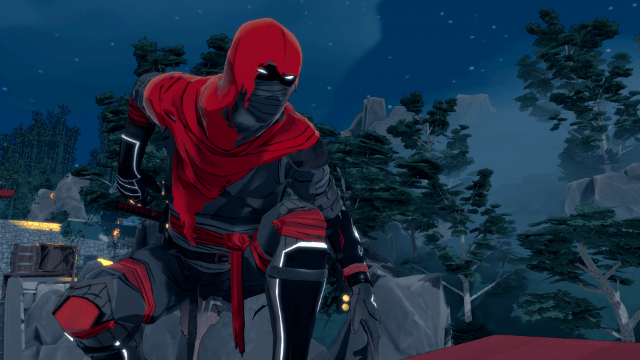 With its stylistic, cel-shaded presentation, Aragami almost feels like a continuous Japanese ink painting, all bold reds and blacks. It’s wonderful to look at and perfectly encapsulates the feel of an ancient, eastern fairytale. It’s most successful in the broad strokes, and finer facial detail occasionally appears distorted and rough compared to the sleek image of it’s mask-clad title character. As you transition from light to dark, the Aragami drains of colour, entirely black save for the calculating slits of his eyes. Your energy bar is represented by intricate, glowing filigree upon your cloak, slowly filling in the design as you recharge. It looks beautiful. Sound design is similarly well-executed and music studio Two Feathers have delivered some exceptional work with the original soundtrack. I was still humming the main theme days after finishing my time with the game, so distinctive and loaded with drama. Music aside, the gut-wrenching feedback as you pierce the neck of an enemy or the rippling, whispering echos as you teleport from the clutches of opponents all sound and feel terrific. Aside from the main campaign, the Shadow Edition comes bundled with Aragami’s first story expansion, ‘Nightfall’. Styled as a prequel and a primarily co-op experience, Nightfall follows Shadow Assassins, Hyo and Shinobu as they too, seek to save Yamiko. To reveal more of the narrative may spoil the story of the main game, but Nightfall goes beyond a mere re-skin of the initial offering. Playable solo or via online multiplayer, you’ll experience events and dialogue slightly differently depending on your chosen character; the gnarled old warrior or the nimble young kunoichi. Nightfall adds a handful of interesting new powers, including the ability to synchronise executions with your co-op partner, an absolute blast when everything goes to plan. It’s more action-orientated and frequently more difficult than the original game. There’s an intriguing foundation of lore to much of Aragami, too often veiled by vague writing masquerading as some big mystery. Nightfall goes some way to filling in those gaps, investing you in the world and fleshing out the plot. As well as Nightfall, the entirety of the main campaign is playable via online co-op and adds countless creative possibilities to the experience. Crouched in a hut, side by side with a friend, we lured guards one by one through the doorway, as I killed them and he quickly disposed of the bodies. It’s a welcome addition and offers an easier method to earn collectibles and experiment. 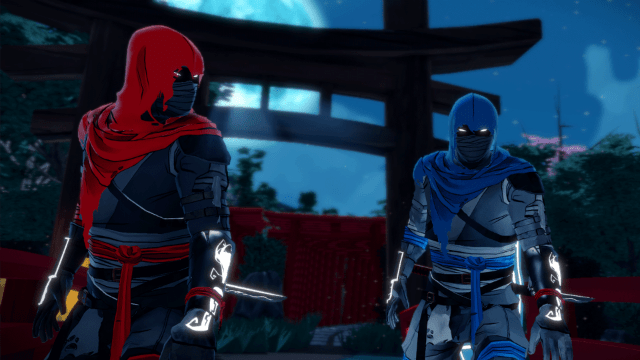 Aragami: Shadow Edition is the best way to experience Lince Works’ lovingly crafted offering of a master-ninja power trip. The future of Aragami is promising indeed.